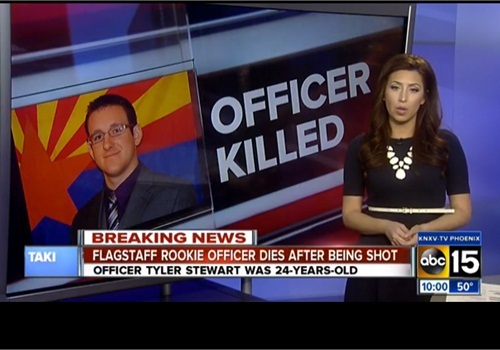 A Flagstaff, Ariz, police officer died after he was shot by a suspect Saturday afternoon. Flagstaff police told ABC15 24-year-old Tyler Jacob Stewart was following up on a domestic violence investigation from earlier in the day and went to a home on West Clay Avenue around 1:30 p.m.
Police said the call involved the suspect and his girlfriend. Police said the suspect and the officer were talking outside the home when the suspect pulled out a gun. They said the suspect shot at the officer multiple times, striking him in the face. Police said Stewart was shot at close range. They did not say whether Stewart had a chance to get to his own weapon. Police said the suspect, identified as 28-year-old Robert W. Smith of Prescott, died of a self-inflicted gunshot wound. They said after shooting the officer, Smith walked away away and shot himself.